Designed for smaller print shops that need the ability to apply foil to smooth pages frequently, but not in a high-volume environment, the Therm-O-Type Foil-Tech manual foil fuser offers fast an easy manual foil fusing. It features a 14 ½" wide feed opening, which means you can apply foil to larger prints, as well as traditional business cards and invitations. 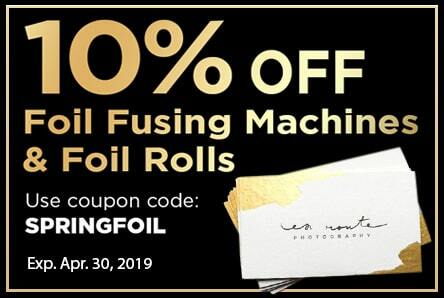 The perfect addition to your copy machine, the manual Foil-Tech foiling machine eliminates the need for expensive foil stamping dies for every design...instead, it uses a specialized thermal fusing foil that adheres to dry toner. This durable foiling machine features adjustable settings for heat and speed, so you can tailor it to fut your exact specifications, lending to an extremely professional and beautiful finish. Once you begin feeding in your sheets, you control the roll pressure with a handle, and can run the machine at speeds up to 1,500 sheets per hour. Buy the Therm-O-Type Manual Foil-Tech foil fuser online and start making your own beautiful and vibrant invitations, awards, business cards, letterhead, wall art prints and so much more. This fusing machine is compatible with our 24 x 500' foil rolls featuring 1" cores, however, the rolls need to be cut down to the allowed 14 ½" width or smaller first. A good starting point for most applications in regards to speed and heat is 40% speed and 255° F.
The "foil fusing" process bonds foil to toner image areas that have been imprinted with a copy machine or laser printer, eliminating the need for a foil stamping die. The Manual Foil-Tech makes it easy to add brilliance to invitations, award certificates, business cards, letterhead and more. Once the Manual Foil-Tech has reached the correct fusing temperature, the paper feed is activated. An operator uses a handle to manually engage and disengage the impression control system. This mechanism releases the foil to the be applied to the toner. Sheets up to 14 1/2" wide by up to two feet long can be run through the machine. When running 11" long sheets through the machine, up to 1,500 sheets per hour can be produced. Fused sheets are delivered into a receiving tray and used foil is rewound for disposal. Variable speed and temperature settings ensure high quality fusing on various paper stocks.